For those who want a strong dose of Italian style and luxury, plus great golf in the beautiful countryside of Tuscany, the Argentario Golf Resort and Spa is the perfect choice. We found 4 offers matching your search. Argentario, with its par-71, 18-hole course and excellent practice facilities, is a visually striking course which, unusually, is suitable for play all year round. The course is surrounded by cork and olive trees in a geographically protected oasis, and it's an area that also enjoys an exceptionally mild climate. The course was designed by renowned architect David Mezzacane, with input from former European tour professional Baldovino Dassù. It is located in Maremma, one of the most fascinating areas of Tuscany and part of the peninsula of Monte Argentario. The beaches of Feniglia and Giannella are close by and you can even reach the centre of Rome in around 90 minutes, while Siena is about an hour away. The course itself is a gem with small greens that can be tricky to find if the prevailing breeze decided to blow stronger than usual. To score well over this testing layout you will be required to play with considerable precision as well as length. 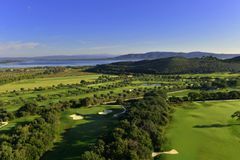 The course enjoys fine views across the valley to the open sea, the Orbetello lagoon and the hills of the Maremma in the distance. The undulating terrain, extensive use of water hazards and rough provide an enjoyable challenge for most ability levels, although this is not a track for beginners. The 330-yard driving range has 24 stations, 12 of which are covered, while there's also extensive chipping and putting areas adjacent to the course. As soon as you walk into the ‘conceptual, multi-level space' with its arched roofing and circular atrium that dominates the lobby, you know this is a resort where style, luxury and quality go hand in hand. This swish resort has 7 suites, 55 junior suites and 11 superior rooms, all equipped with terraces or balconies and just about every feasible comfort you can think of, including plasma TVs, CD players and internet access. The seven suites have different styles and themes but are equipped with large solarium terraces and provide views over the course and the Orbetello lagoon. The resort has 11 Superior Rooms with terraces overlooking the golf course, while Junior Suites are found on three different levels, and all come with views over the golf course towards Orbetello lagoon. Like the rest of the hotel, style is at a premium, with black and white colour schemes dominating, together with warm oak flooring and designer furniture. The restaurant presents the head chef's very personal - and delicious - interpretation of Tuscan cuisine.